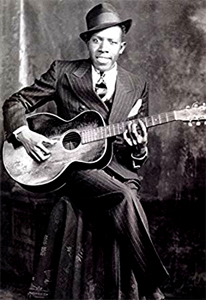 Robert Johnson was born and raised in the Mississippi Delta and began playing guitar in the 1920's. 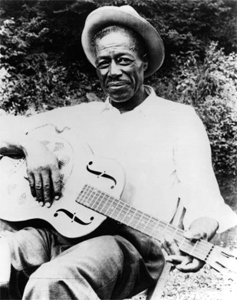 Today he is recognized as one of the most important innovators of the Delta blues. Many fascinating legends surround his music and history, the most prominent being his encounter with the Devil at the "crossroads." Then Robert disappeared for a season. Legend recounts that he found himself at a dark and deserted crossroads around midnight where he was met by a strange man. The man tuned his guitar and played a few songs and returned it to Johnson. When he reappeared in 1932, the people were amazed at his unique and novel techniques and unusual voicing. When Robert played for Son and Willie; they were staggered by his improvement. “He was so good. When he finished, all our mouths were standing open.” The legend grew that he had sold his soul to the devil to become a famous bluesman. Like his whole life, Robert's death is shrouded in mystery. 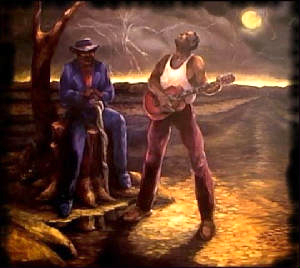 According to David ‘Honeyboy’ Edwards he was playing in a juke joint at the Three Forks Store near Greenwood, MS and was poisoned supposedly by one of his woman friends or perhaps the store owner, whose wife was a "friend." Confusion surrounds his burial also. There are three headstones in separate cemetaries around the Greenwood area. 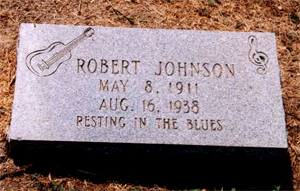 Blues aficionados are fortunate that he recorded 29 songs in Texas a few years before his death, including "Me and the Devil Blues" and "Crossroad Blues." 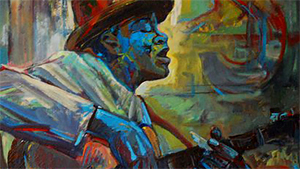 His legacy has influenced great bluesmen like Muddy Waters, Eric Clapton, and the Rolling Stones. 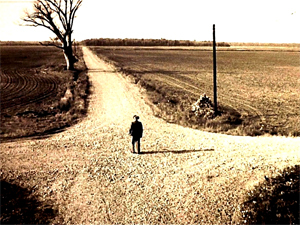 The actual location of "The Crossroads" is of course in dispute also. Some claim it is at the intersection of Highways 8 and 1 south of Rosedale. Others say it was at Dockery Plantation, near Clarksdale. 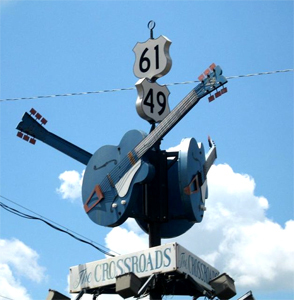 Clarksdale, the birthplace of the blues, lays claim to the location of Highways 61 and 49 and has staked that claim with a giant guitar sign. 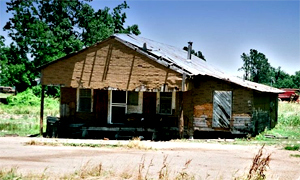 Highway 61 is known as the "blues highway" and Highway 49 is the road to Parchman Prison, inspiration for many blues songs. Come see for yourself...around midnight.